I have to admit something... I don't wear much makeup, I don't wear makeup regularly, and I am not that good at applying makeup! So when I set myself the challenge of doing a full face with Inika, I was a bit worried at what the results would be! I have set myself the task of wearing at least one makeup product every day through the month of March, since despite all my admissions, I somehow have ended up with loads of products, especially eyeshadows and lipsticks. I don't want them to go to waste, so here I am, trying to doll myself up so I can get used to some of these items! Lipstick I can never get quite even, eyeshadow I just sort of slap on and blend to the best of my abilities, highlight I think I finally understand after watching so many grav3yard girl and Safiya Nygaard YouTube videos, and all the rest... let's just say I have not ever attempted to contour, and I probably never will! It's not that I don't like the idea of getting glam - I just have never learned and don't usually have the time or patience to really try. That being said, please don't judge my skills too harshly! The products I have to work with are primer, foundation, setting powder, highlight, lipstick, eyeliner, and eyeshadow. I realized after the fact that I don't actually own an Inika mascara yet, so I chose to go sans mascara. Whoops! I started by dabbing on a little bit of the Inika Pure Primer onto my face and then blending it in sort of like I would my moisturizer. This probably shows how little I know about doing makeup, but I still am not sure what the primer is really for! Is it to help the foundation stay? Is it to hydrate the skin under all the rest of the products? Both??? 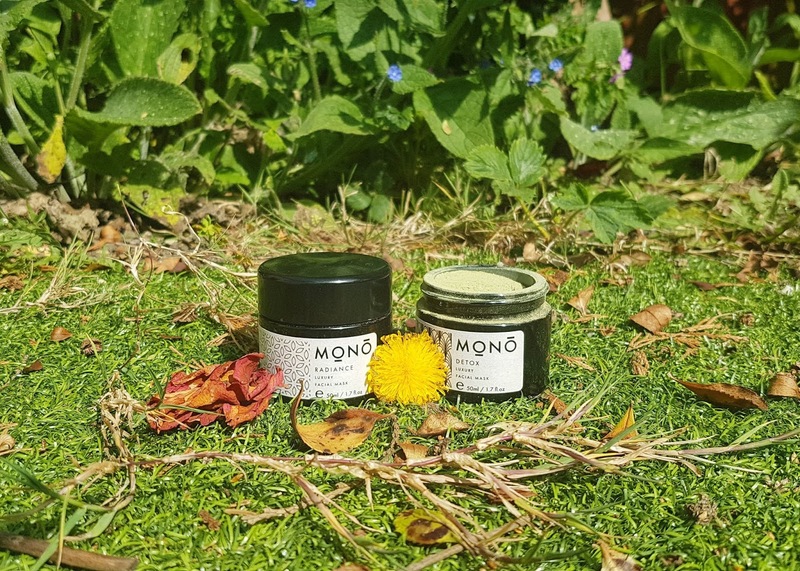 I've done some looking into it, and apparently it is designed as a base product which allows everything else to go on smoothly for a flawless finish, and it helps everything to last longer. Once my primer was on, I started on my very first attempt to apply foundation. Yes, you heard me right - I have never worn foundation! I chose shade "Grace P1" which is the lightest of Inika's twelve shades. I am a ghost. I was honestly surprised by how easy putting this product on was, as I was expecting to spend at least 45 minutes trying to get it right. To be honest, I probably didn't do it 'right' but it worked out in the end! I just swirled my PHB powder brush around the top of the pot to get some foundation on the bristles, then used circular motions around my face until it looked even. Next up was highlight, something I am slightly more familiar with! I used the Inika Light Reflect Cream which is actually becoming a favourite of mine. It is a pretty natural highlight with minimal glittery shimmer, and I love how easily it applies. Since it is a cream it blends into your skin really nicely, and it sinks in a little so there is no wetness to the product. After that was eyeliner, and this was the product I was most comfortable applying as I tend to wear at least a little bit on my outer waterline most days. 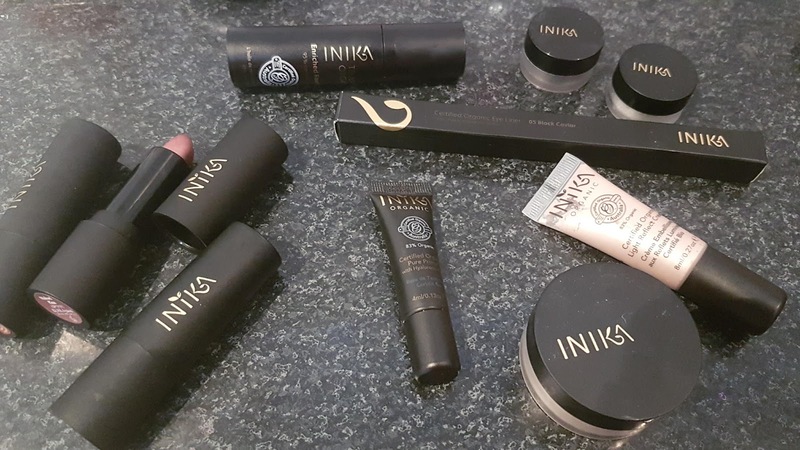 The Inika eye pencil in Black Caviar is not a pure black I would say, but is pretty close. You need to warm up the tip a little before it goes on really smoothly, but once you start it glides on well. I would suggest this pencil for the lid of the eye, as I found it great for making a little wing - not quite a cat's eye, but close! 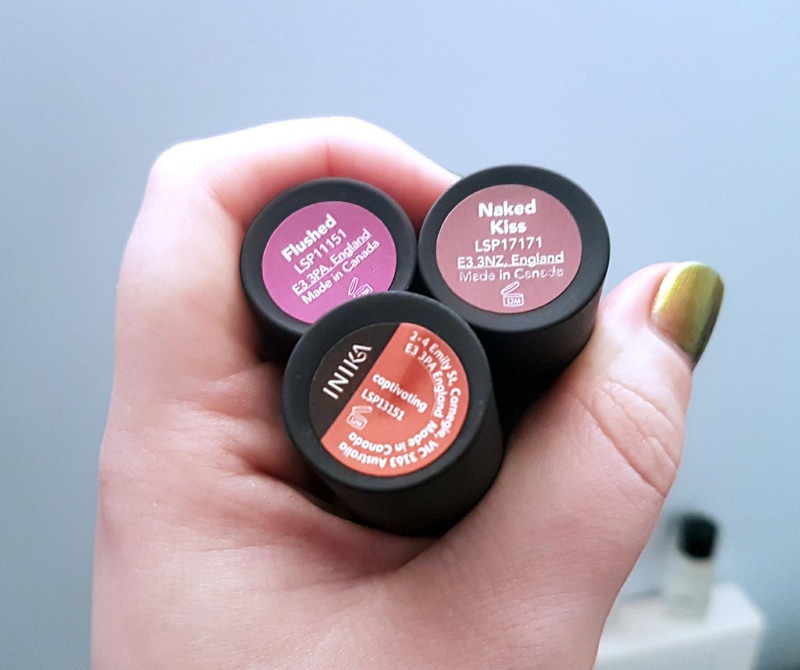 Choosing my lipstick for my full face with Inika was a little trickier, as I absolutely love all the colours I own from this brand. Each one has a very subtle metallic shimmer, and they apply so smoothly and last ages. Flushed is probably the boldest of the three I have, and is a rosy pink. 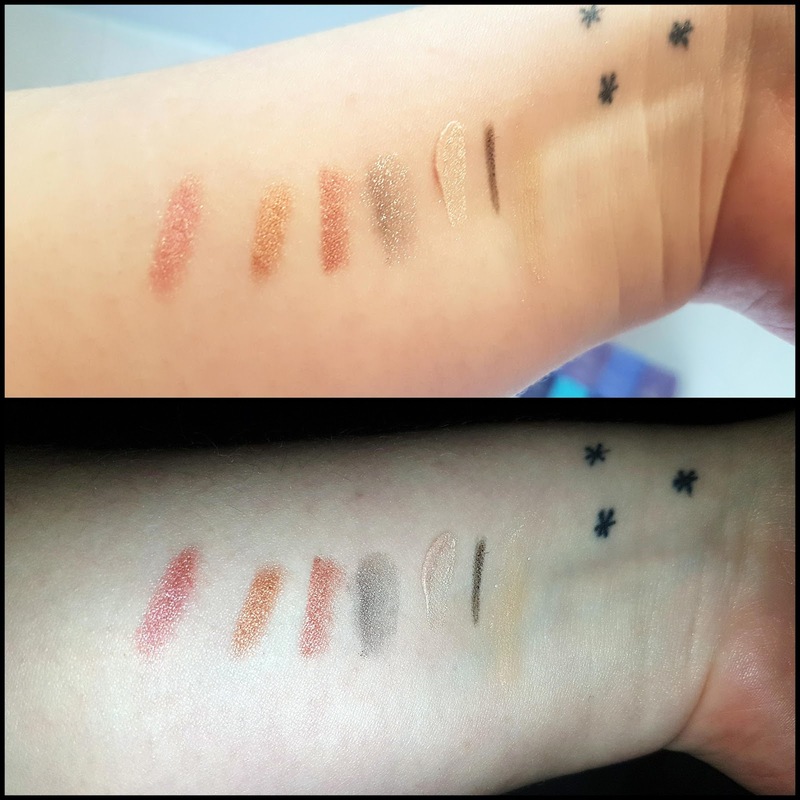 Naked Kiss is a bit darker and is meant to be the 'perfect neutral,' but it definitely still has some pink undertones to it (see my full review). My most recent purchase, and possibly my favourite of the three is Captivating, a copper shade that is almost the perfect match for my hair. In the end I decided on Naked Kiss as I thought it would compliment my eye shadow choice the best. Last but not least was eye shadow, though afterwards I realized I probably should have done this before my foundation. You live you learn! 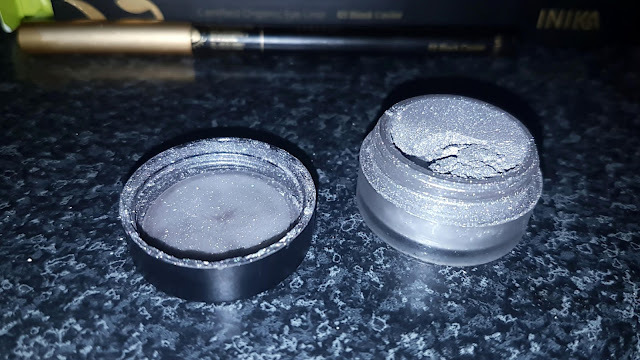 I wanted to test out a smoky eye, or at least a very basic smoldering look, so I chose to use the vegan mineral eyeshadow in shade Gunmetal, a gorgeous metallic silver that is highly pigmented. 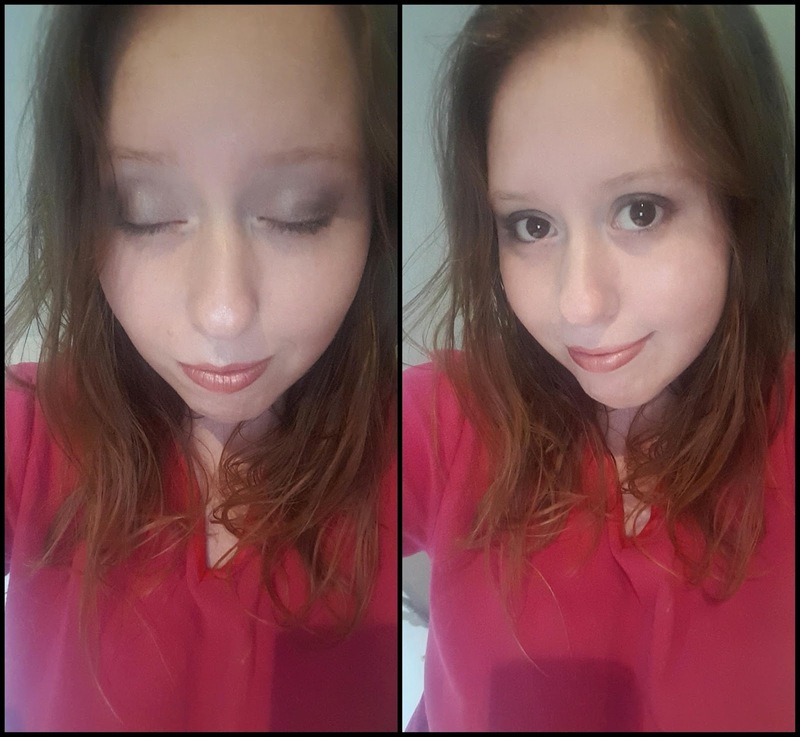 I used a very light sweep across my lid to start with, then layered a little more on the outer corners of my eye to add some depth to the look. While it isn't the most elaborate or daring look, I am actually really proud of my first attempt at a full face with Inika -- I tried out products I have never used before, and used way more makeup all at once than I am used to. While I probably would not recreate this on a daily basis, I will definitely be considering getting a bit more detailed on our rare nights out. Maybe I will even venture into the world of contouring (keyword here is maybe!). So what do you think of my first try? It isn't the worst, right?? Let me know your thoughts down in the comments below, or maybe even leave me some tips for my next go at a full face of makeup! And let me know if you would like to see more makeup looks in the future! You can share your ideas for styles to recreate over on Twitter or Instagram! I love a good make up haul! Good going on the first attempt! I adore that gunmetal eyeshadow and your lipstick is a beautiful colour too and looks really pretty on you. I have never heard of Inika before. It looks really good on you, I might have to check them out! Those lip colours are absolutely beautiful! I love your make up! You look incredible! I think you did a good job, I rarely wear makeup myself but its nice every now and again. 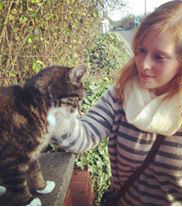 I don't wear much make up either so I am always fascinated by what other people do! You look great! I'll have to try out Inika, they sound fab.